I feel sorry for millennials. They are suffering from the same stereotypical generalisations that has plagued their parents and grand parents. Marketers think they are the only game in town. Many employers believe they are an infuriating bunch to manage. As always they reality is much more complicated. The one thing that is for sure is that for some time - like a decade or two - their parents and their parent's parents will be a lot more important to the wealth management industry. This chart, from The Deloitte Centre for Financial Services, says it all. 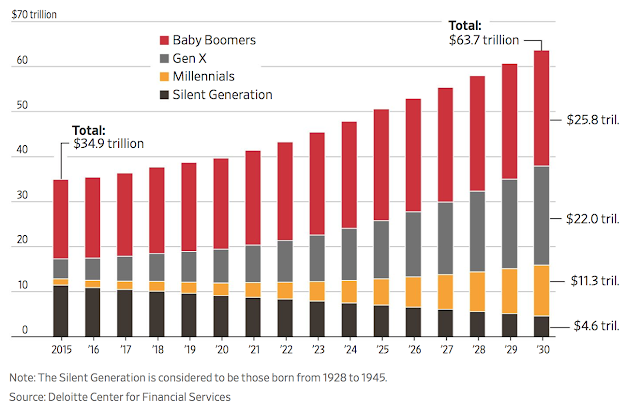 It shows the total value of financial assets held by each generation.